NEW YORK, NY--(Marketwired - Sep 28, 2016) - United Nations, During the High Level week of the 71st session of the UN General Assembly where president Obama addressed world leaders for the last time, key influencers gathered in the United Nations SDG Media Zone to discuss climate action and the early adoption of the Paris Climate Agreement. 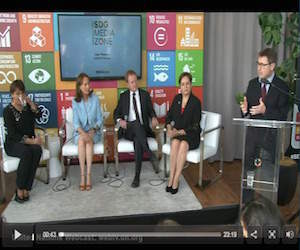 French environment minister Segolene Royal, the president of cop 22, the Moroccan Environment Minister Hakima El Haite joined UNFCCC chief Patricia Espinosa, the World Bank's John Froome in a session moderated the UN's Dan Thomas. "This is a very special week at the UN and we wanted to take advantage of the presence of so many world leaders by creating a platform -- the SDG Media Zone -- to spread the word about the Sustainable Development Goals to people all around the world," said Dan Thomas, Communications Director for the UN President of the UN General Assembly. "This social media space and live webcast has revolutionized the way the UN approaches communications by offering the audience an opportunity to truly engage in the conversation happening at the UN." The SDG Media Zone is powered by a partnership between Office of the President of the General Assembly, Executive Office of the UN Secretary-General and the United Nations Department of Public Information and PVBLIC Foundation's Digital Media Zone platform DMZ.News. The SDG Media Zone is a designated space hosted in parallel to High Level Meetings and Summits that works as a "live social media newsroom" where journalists, bloggers, celebrities, media influencers and high-level delegates from around the world can join the conversation, generate discussion and engage the global online community during the United Nations General Assembly High-Level week, supporting the implementation of the Sustainable Development Goals. Official anchor partners for the SDG Media Zone include Groupe Speciale Mobile GSMA, CODE.org, Made with Code, supporting partner Every Woman Every Child EWEC, and media partner 1-800-PublicRelations "1800pr". Some of the discussion and partnership that will be celebrated and showcased this week are; Implementing the SDGs - Universal Push to transform our world, UN Virtual Reality, Women and the SDG's, Earth To Marrakesh, SDG Advocates, CASIS and NASA, Effie Worldwide, Project Everyone & One For All. About Sustainable Development Goals (SDGs) On 1 January 2016, the 17 Sustainable Development Goals (SDGs) of the 2030 Agenda for Sustainable Development -- adopted by world leaders in September 2015 at an historic UN Summit -- officially came into force. Over the next fifteen years, with these new Goals that universally apply to all, countries will mobilize efforts to end all forms of poverty, fight inequalities and tackle climate change, while ensuring that no one is left behind.